For U.S. drillers, the dreaded correlation between stocks and bonds is back. Earlier this year, while equity investors were killing them, the companies could bask in the warm glow of bondholders’ confidence. Then the U.S. price of oil tumbled below $50 a barrel and kept sinking. Natural gas took a dive, too. That’s when the warm glow turned cold. 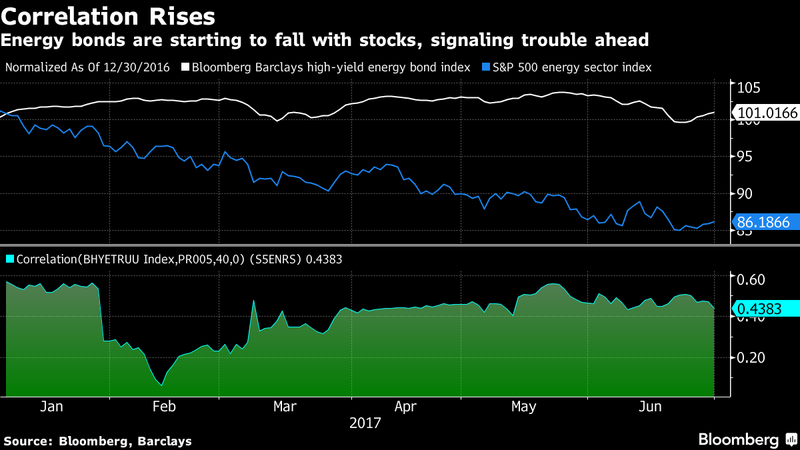 Energy junk bonds have been hit especially hard. They slipped more than 2 percent in June, according to a Bloomberg index, after increasing 38 percent in 2016 — a year when 89 energy companies filed for bankruptcy. Meanwhile, the S&P 500 Energy Sector Index has slumped 16 percent since Jan. 3, while the S&P 500 is up nearly 8 percent in the same period. That means bond investors have joined their shareholder counterparts in anticipating rocky times for U.S. oil and gas producers. They’ve begun to reevaluate whether companies can survive at current price levels. Many of them said the 2014 price bust, when West Texas Intermediate lost more than half its value in seven months, winnowed the weakest companies. But according to the numbers, traders have concluded that there’s more culling to come. The broad index of junk-rated energy debt has been dragged down by the weakest companies. Notes rated in the triple-C range have dropped more than 7 percent this year, Bloomberg Barclays index data show, while bonds rated B and higher have gained. Last month, bonds from triple-C-rated Denbury Resources Inc. decreased more than 16 percent and Los Angeles-based California Resources Corp. notes lost 14 percent. In the same period, shares of Denbury, a Plano, Texas-based explorer, were little changed and producer California Resources declined 21 percent. Offshore drillers’ debt also faltered in June, with W&T Offshore Inc. sinking 10 percent and Ensco Plc declining more than 4 percent, while shares fell 4 percent and 17 percent, respectively. The fact that energy debt didn’t plunge as much as equities in the beginning of the year is an “interesting phenomenon,” QEP Resources Inc. Chief Executive Officer Charles Stanley said at a June 27 conference in New York. “The equity responded negatively to the downturn in commodity prices much quicker than the debt has,” Stanley said. Shares of QEP, which is rated in the highest tier of junk-bond grades, have declined 45 percent so far this year, while its bonds dropped 1.9 percent in June. Energy shares often nosedive before bonds because falling oil prices can crimp corporate profits. That’s bad news for shareholders, but less of a concern to bondholders, who worry most about a company’s ability to repay debts. Another reason stock investors act on their bearishness before bondholders is bankruptcy law. Equity is wiped out in bankruptcies. Creditors, on the other hand, typically get some return, even if it’s just pennies on the dollar. The broader high-yield universe is faring better than junk energy bonds. The Bloomberg Barclays U.S. Corporate High Yield Bond Index has gained 4.8 percent this year. The performance of junk bonds is less tied to energy prices this year, in part because more companies have hedged their exposure to the prices of commodities like oil, according to a report from JPMorgan Asset Management. On the equity side, oil-focused companies have been hit harder than those focused on natural gas, which has lost half its value since its peak in 2014, according to David Deckelbaum, an analyst at Keybanc Capital Markets Inc. in New York. Oil at that price isn’t a death sentence for companies, especially since many have made strides to strengthen their balance sheets since the 2014 debacle, said Joan Okogun, an analyst at Fitch Ratings. Still, it’s enough to make investors jittery.